Hello ... Hello ... my old friends ... It's great to see you once again! 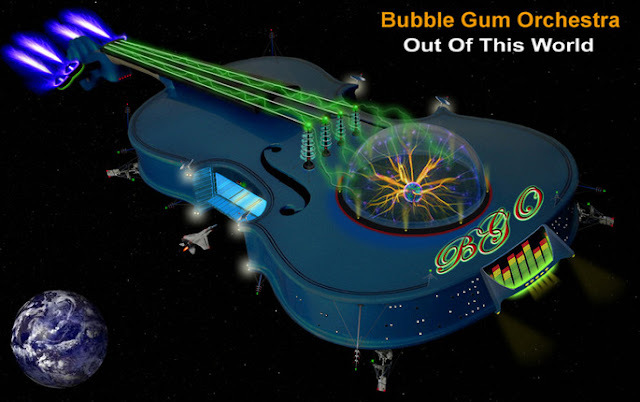 I find it interesting that some postings about a new ELO related project entitled Bubble Gum Orchestra [BGO] have started to sprout up both on Facebook and elsewhere as their new album "Out Of This World" is released on Tuesday 27th September. What is also interesting is that they have dropped a comment or two on some of my recent [non-related] blogs plus they're following ELO Beatles Forever ELOBF] too! "Bubble Gum Orchestra is an American band with a flair of English pop rock influences among many others. Michael Laine Hildebrandt - songwriter; composer; singer and all-round "guru" has composed a seventeen  song gem rooted deep from his influences of the 70's era style "double album" days of yesteryear." Side 3 - "Concerto For A Sad Day"
ELO Beatles Forever ELOBF] has contacted Michael and BGO and hopes to arrange a long distance interview in the next few weeks, hoping to assist BGO in promoting what looks like being an interesting release for fans of not only ELO but also other class bands from a superlative musical decade. Expect a review of "Out Of This World" in the next few weeks folks! Thanks for this article Keith. I told my listeners about BGO on my The Light Shines On: ELO and related artists show today, and played "Night In Shangri-La". When you get in contact with them, can you put them on to me too, let them know that I can promote their album for them on the radio, thanks. I look forward to our upcoming long distance interview. We will give you a peek into the inner workings here at BGO Headquarters. Would love to discuss any or all the 17 songs on our debut album "Out Of This World".